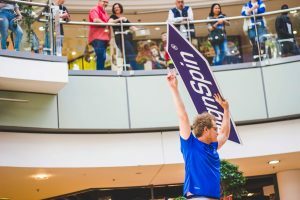 Soren Wins the First Ever German Sign Spinning Championship! Sign spinning continues to make its mark internationally. In recent years, spinners from Korea, Germany, and Croatia have claimed top 10 finishes at the World Sign Spinning Championships. For the first time, AArrow Germany held the German Sign Spinning championship and believe me its something you don’t want to miss! After placing in the top 25 in the WSSC 18, AArrow All-Star Soren Knauft approached the competition with objective claiming the title. Following an impressive showing of his skills, Soren was able to claim the first ever German Sign Spinning Championship! It wasn’t easy though, Soren had some stiff competition from Alex Kleissle and Jan-Niklas Blöt who rounded out 2nd and 3rd place. Paul Merkel and Alex Kleissle took home the title for best group performance as well. Thank you to VogelKaiser, the Allee-Center Magdeburg and all of our sponsors!